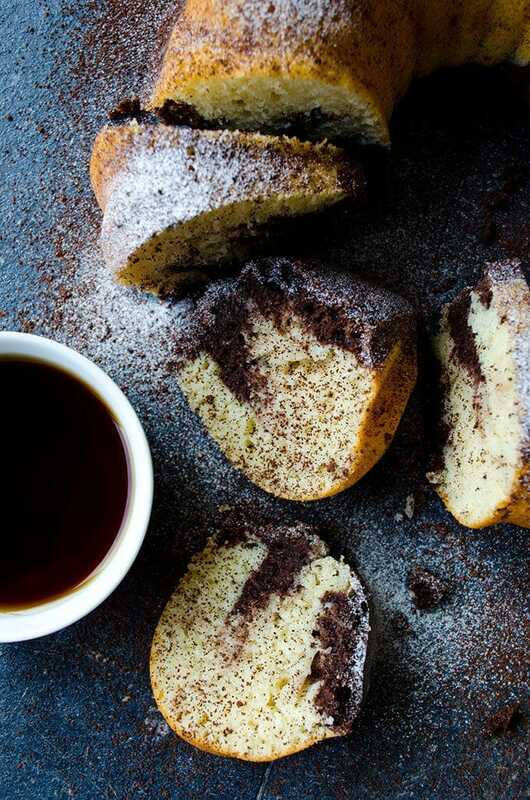 Marble Yogurt Bundt Cake is an all-time classic cake that every home cook should learn first. Moist, fluffy and easy to slice. 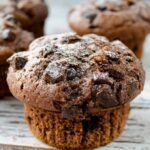 Perfect for breakfast, brunch or after school snack! This Yogurt Bundt Cake used to be my favorite cake as a kid. Mom used to make it whenever she had guests and I just couldn’t wait to go back home from school to join their five o’clock tea party, which was full of other luscious treats. Well, it’s not just my mom, all moms in Turkey make this yogurt bundt cake for afternoon parties. Yogurt Bundt Cake is a classic one here. It is the basic cake you learn from your mom. Every Turkish girl knows it, so everyone calls it mom’s cake. When you ask any Turkish woman their ultimate cake recipe, 99% of them will give you the recipe for this yogurt bundt cake, so it is also known as the cake. On the other hand, mom is still confused when I make a cake without yogurt. She couldn’t believe that a cake could be made yogurt-free. Making a yogurt bundt cake with a chocolate swirl is another classic method of cake baking here. It is a way of showing that you value your guests more by not making the basic version of a cake. Although there are two layers, this is a one-bowl cake recipe. First prepare the mixture for the yellow layer in a large bowl and pour 3/4 of the batter into the prepared pan. Then add cocoa powder in the remaining batter and combine well. I keep just ¼ of the cake batter for the final cocoa swirl, but you can use half of the batter to make a larger layer. The dark batter will be thicker than the plain one, but don’t worry. The cocoa layer will be slightly crispy on the outside when baked, which is another nice thing about this cake. This two-color yogurt bundt cake is the perfect way to celebrate the coming of fall season. I remembered lots of things from my childhood as the cake was baking in the oven. The wonderful smell of it took me to several years back. A great feeling of nostalgia is the summary of this cake. 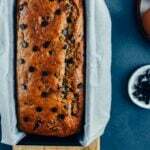 If you are craving for a more chocolatey cake though, you should check out our Yogurt Chocolate Zucchini Bread when we can still find fresh zucchini. This yogurt cake is a trusted treat because it is the recipe that has been followed by Turkish women for ages. The yogurt gives a nice moistness to the cake. It is a soft cake that is easy to slice and doesn’t dry out fast. You can store it in an air tight container up to 5 days. There is no additional flavors used in this classic yogurt bundt cake. Just vanilla and cocoa powder for the dark layer. This classic yogurt bundt cake is mostly served as it is. No dusting or icing. However, we wanted to make a twist on it when serving. Dusting it both with powdered sugar and cocoa powder was Yusuf’s idea. He says there must be two colors of dusting to complement the light and dark layers. I loved the result! What do you think? To make a change next time, I will try Sommer’s Fresh Strawberry Yogurt Cake, which looks so moist but I will have to wait until strawberry season next year. Check it out! Maybe you can try it earlier than me if you still have some berries in your area. If you have a chance to make this Marble Yogurt Bundt Cake Recipe, I’d love to hear your feedback! Please rate the recipe and leave a comment below! 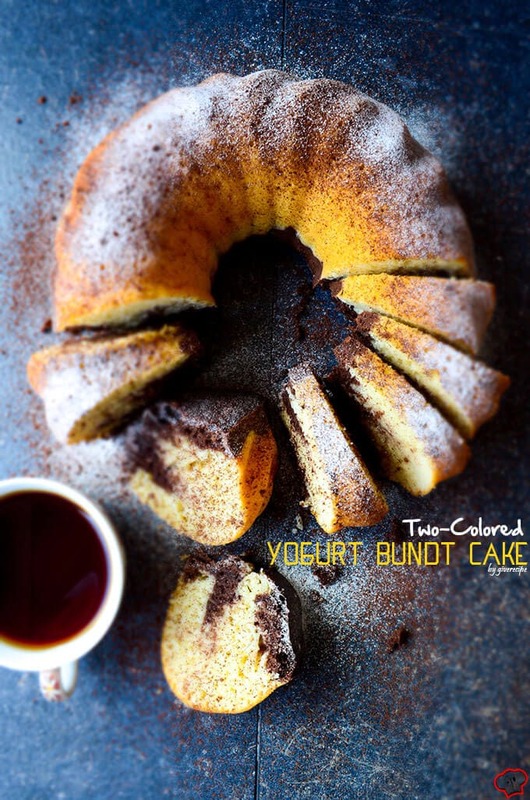 Basic yogurt bundt cake with a swirl of cocoa powder. The easiest one-bowl cake with a fancy look ever! Butter a 9 inch bundt pan. Beat eggs and sugar with an electric mixer until creamy. Add in olive oil and yogurt and mix well. Sift the flour directly into the mixing bowl and mix with a spatula. Add in baking powder and vanilla powder or extract and stir well. Don’t overmix though. Just until everything combines. Pour 3/4 of the batter in the pan. Fold in the cocoa powder to the remaining batter and mix well. It will be thicker, but don’t worry. It will be great when baked. Pour this dark batter right on the plain batter in the pan. Swirl randomly with a fork and bake for 45 minutes. Let it cool down for 15 minutes and then remove from the pan. 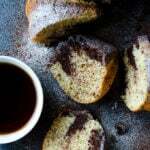 Dust with powdered sugar and cocoa powder when it cools down completely. This post was originally published in 2014 and has been updated with additional information. Excellent recipe. I used wholemeal self raising flour and reduced sugar to 3/4 cup as I Prefer my cake mildly sweet. Very moist cake that feels light due to no butter. Thank you!! Tried it for a dinner party using orange juice and zest instead of lime. My cake turned out really dense. I used greek yogurt (it’s all I had) and halved the sugar. Do you think these substitutions are what ruined it? Hi Shia! I wonder how it will turn out with heavy cream. Would be great if you can share the result with us here. Adding raisins is a great idea and I need to try it as well. Hey, this cake was good! At first, I was a bit skeptical due to our lower quality olive oil, but the result turned out pretty neat 😀 Recipe saved. Zerrin, it is my first time come to your place through PInterest, I am totally fall in love what your posts. They are amazingly healthy and easy to follow. I am going to make this cake in a few days, I will get back to you and tell you how it is going, and I am a beginner in baking, but I am looking for some recipes that are healthy and yummy. I am in. Thanks again.